The Uffizi Gallery is one of Italy’s most visited museums, seeing about 2 million visitors a year, so it can get very crowded. 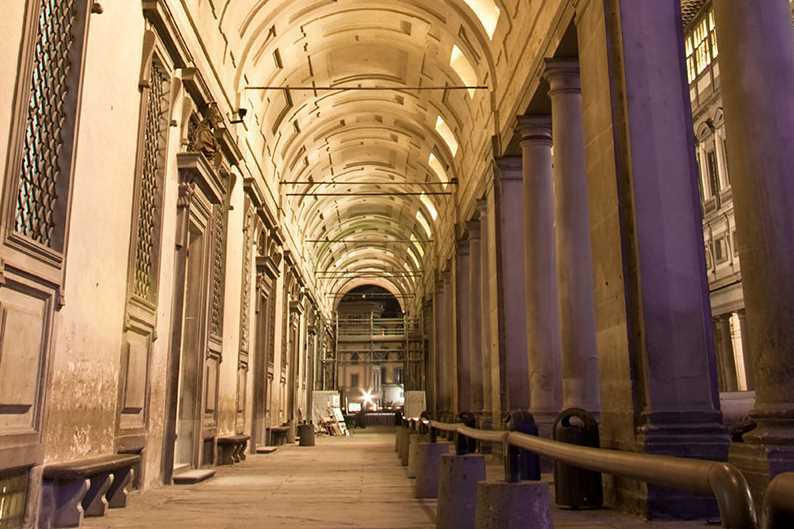 Founded in the 16th century to house the Medici family art collection, it’s one of the world’s oldest art galleries. There are 45 rooms filled with thousands of art works, ranging from sculptures to Renaissance and Baroque paintings. Botticelli’s Birth of Venus if probably the most famous painting. Top artists whose works you can see in the Uffizi include Michelangelo, da Vinci, Raphael, Giotto, and Titian. If you can, reserve your tickets for early morning (the museum usually opens at 8:15 and is closed on Mondays) so you’ll have a little time with fewer visitors. Plan for at least 2 hours inside the museum. You can skip the ticket line by buying tickets in advance or booking a guided tour. Buy skip-the-line Uffizi Gallery tickets on Viator, or through B-ticket, the Florence Museums site. Book an Uffizi Gallery Renaissance Florence small group tour with the Roman Guy and use promo code ITALYMARTHA for a 5% discount. While the most famous work in the Accademia is Michelangelo’s David, there is a huge collection of Renaissance art to see including a couple of other works by Michelangelo, paintings by Sandro Botticelli, and a room dedicated to Giotto. There’s also a small gallery of musical instruments. To skip the ticket line, buy Accademia Gallery tickets through Viator or from B-ticket (see link above, under Uffizi Gallery). The Roman Guy’s Florence Small Group Walking Tour or Full Day Walking Tour includes a visit to the Accadema to see the famous David statue. Use promo code ITALYMARTHA for a 5% discount when you book this tour online. The interesting Palazzo Vecchio Secret Itineraries, one of the Palazzo Vecchio Tours options, should be booked in advance as there are a limited number of spaces for the tours. This tour takes you to places not normally open to visitors including hidden rooms, staircases, and the attic. After the tour you can stay in the Palazzo Vecchio on your own for a longer visit. Other options using the above link are the regular guided tour and a fresco painting workshop. Compare prices of hotels in Florence. See Florence rail station and train routes or book train tickets on Rail Europe. Find the location of top sights on this Florence Map.